If you have not heard of Jeni’s Ice Cream then you live under a rock with no access to print media, television, the webernet or me. I have been tracking the artisan ice cream crafting of Jeni Britton (Britton-Bauer now) since she scooped her primordial ice creams at Scream ice cream in the last decade. 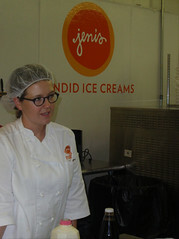 I have written and blogged about Jeni’s in many media over the years. 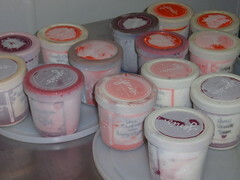 Of course Jeni’s is pretty critical to my whole “ice cream capital of the world” campaign. 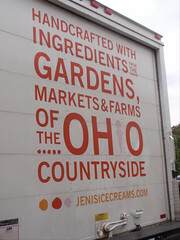 So when I saw that a Local Foods Week tour was being offered at the Jeni’s plant I moved with haste to lock in my spot. I was one of twenty callers that called in time. Over 50 people were on a waiting list for the tour. It is good to see good things in our world. 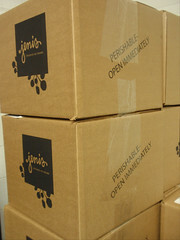 Jeni’s is an example of a good person that did good work and as a result has achieved splendid things. Having the Bauer team on board helped a lot to build the business. I have often seen great success happen for people that were not so great. Such is not the case here. Jeni’s ice cream is one of the major pins that has places Columbus on the culinary map. You can expect to see a Jeni’s ice cream cart at any local event that promotes Columbus and good food, especially if there is a charity involved. I think the world of these folks. In the world of Ice Cream the baseline is good, so any ice cream maker can pretty much just show up and do well. Jeni has never been content with doing well, she constantly pushes the threshold for quality of product, service and flavor. 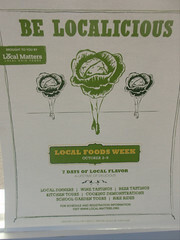 I am not cresting over the hump of Local Foods Week too well. It has been a massively busy time for eating and writing since August with almost daily events, meetings, dinners, etc., so I am starting to waddle and wane. 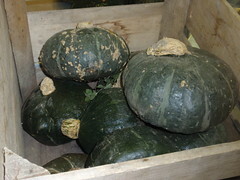 Therefore for I am taking the lazy but timely approach of just posting photos and letting you fill in the gaps. More details on the tour just seems cruel to those that were on the waiting list. (After the photos, I am recycling parts of a magazine article I wrote on Jeni’s years ago for people that do not know the Jeni’s Ice Cream history). Jeni Britton laid the foundation for her artisan ice cream career before she graduated from high school. She was among the first employees when Graeter’s premiered in Columbus. Later, Jeni walked across the parking lot to work at La Chatelaine where she learned the art and craft of making fine French baked goods and developed an appreciation for new flavors and culinary styles. 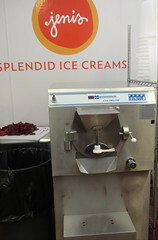 Jeni opened Scream Ice Cream in 1996 with a passion for making ice cream her way. The shop had a good four-year run, but Jeni wanted to improve on her business concept and develop a craftsperson’s approach to fine ice cream. To advance her art, she took the famed Penn State Creamery Ice Cream course, studied with an Italian gelato maker and traveled extensively in pursuit of ice cream excellence. She then opened Jeni’s Fresh Ice Cream in 2002. Over time she has made the business a family affair by adding her husband Charly Bauer and brother-in-law Tom to the fulltime team. Collectively, Jeni’s has continued to develop a loyal local and national following with an innovative concoction of flavors. Instead of relying on a lot of syrups and sugars, Jeni’s combination of special recipes and unique ingredients allow the natural flavors to come out to your taste buds. There are seasonal variations and signature flavors; an appetizer of flavor examples includes Sweet Corn with Black Raspberries, Bartlett Pear with Riesling Sorbet and Strawberry Rose Petal. These cutting edge creations caught the attention of the culinary critics on both coasts resulting in a Food and Wine Tastemaker Award in 2005, an appearance on Roker on the Road and numerous magazine articles. 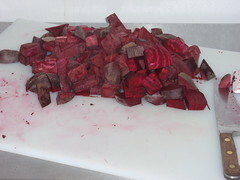 Constantly cooking up these creative flavors allows for challenges and opportunities. 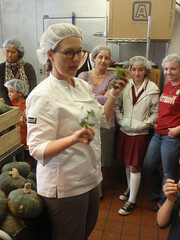 The focus on local, natural, and seasonal ingredients causes Jeni to constantly forage for new purveyors and products. She has developed strong relationships with local farmers to obtain items such as milk and honey to meet her specific requirements. This quest for fresh ingredients led Jeni to be chef chair for the local branch of the Chef’s Collaborative, an organization that promotes chefs and farmers working together to create markets for local foods. 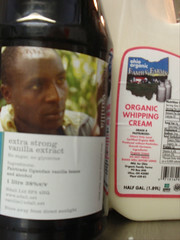 Preparing the components for an ice cream recipe is labor intensive. Everything is made in house including the marshmallows, pralines, sauces, and such. Interns from the Graham School mix the hard work of separating mint leaves with reminders from Jeni about how important math is to getting the right combination and ratio of flavor in each batch of ice cream. Jeni even experiments with the OSU diary science program in her quest for ice cream perfection. One day, she would like to own her own organic diary – she is that passionate about her product and what goes into it….. from Cow to Cone. This entry was posted on October 6, 2009 at 10:10 PM	and is filed under ice cream, tour. 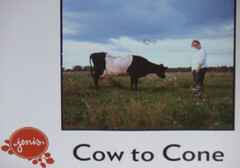 Tagged: Cow to Cone Tour, Jeni's ice cream, Local Foods Week. You can follow any responses to this entry through the RSS 2.0 feed. You can leave a response, or trackback from your own site.